What's Going to Fill that Now-Empty Lot on Holloway at La Cienega Boulevard? What’s Going to Fill that Now-Empty Lot on Holloway at La Cienega Boulevard? Illustration of project at 8500 Holloway Drive, on the southwest corner of Holloway and La Cienega. Neighbors of the lot on the southwest corner of Holloway Drive and La Cienega Boulevard have long complained about the dilapidated building on it. 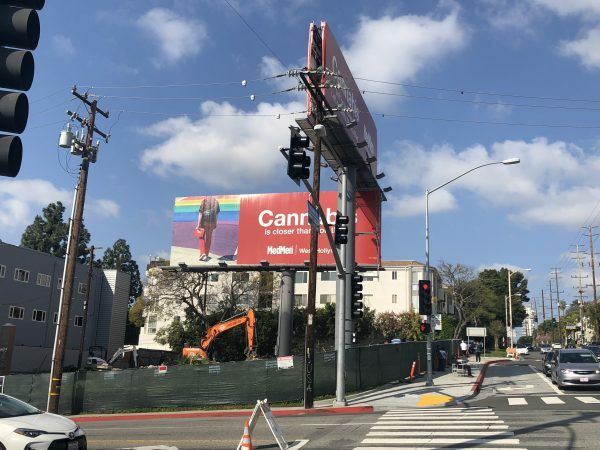 And then there are those two massive billboards currently promoting MedMen, the cannabis retailer. But neighbors, and those stuck in traffic during rush hour at that congested intersection, have noticed that things are changing. So what is happening behind that green fabric fence that now borders the lot shields from public view the demolition of the building that was on it? Rear view of project at 8500 Holloway Drive, on the southwest corner of Holloway and La Cienega. City documents show that Danny Moizel, identified as senior vice president of real estate at BCBG Maxazria Group, who is based in Vernon, is the contact for the project (the lot used to feature a billboard promoting Maxazria.) But Moizel also is founder and CEO of Utopia Development Inc., a firm whose projects have included locations for high-end retailers such as Halston, Michael Stars and BCBG and salons such as Bellami. It is not clear what will be housed in the buildings at 8500 Holloway Drive. Moizel has not responded to several inquiries from WEHOville. Duly noted. Does anyone know what the previous building was used for? Unsafe, yes. Unsightly, yes. But it had an interesting structure and looked like it might have had an interesting use at some point in its life. Whenever I’d go by there, I’d imagine what it must have been like when it was used. Anyone know?? 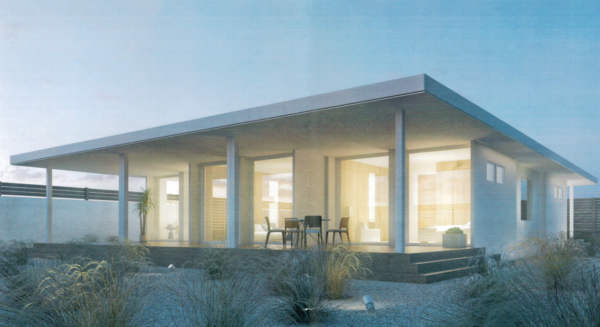 It’ll be a model house for Azria Home. Open to any potential customers to view, probably by appointment only. Mystery solved. The most valuable and profitable quality of that site is the billboard. It is grandfathered and they are no longer allowed. That’s why where ever you see a billboard in West Hollywood, you can be sure nothing will be built to eclipse it’s view. The new building looks just like the new Cha Cha Tea place on Robertson. It’s very nice. My guess is they don’t want to remove those billboards which generate a lot of money. As long as the new buildings look good and don’t impact traffic, I’m fine with small single story structures. Now if we could get rid of the Alta Cienega Motel and that dead awful strip mall below it! Just a two story commercial building? Seems like a wasted opportunity. THRILLED to see the abandoned eyesore removed. 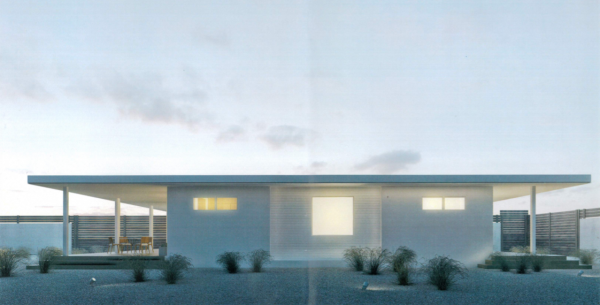 Anything is better than what was there…just wish that something more substantial was going to be built in its place. I’ve been passing this building daily for almost a decade and It has been an eyesore this whole time. It’s destruction has me feeling positively peachy. I do wish they were able to do something more substantial with this lot. It’s a high traffic intersection with a lot of potential and the adjacent buildings (within the block) are much larger. Now if only they could improve the two northern corners of this intersection. Don’t think Chevron wants to remove that station on the NW corner any time soon. Soon enough, gas may become hard to find in the city as development takes over everywhere.